For students looking for some part-time, minimal commitment work, a great option on Elon University’s campus is to work at the Elon Poll. Students will get paid by the hour, earn a free dinner, and will make calls to citizens during the evening, gauging their perspective on state and national issues. Throughout the year, the Elon Poll conducts several surveys, with some of the most influential coming around election time. The Poll started in 2000 and polls are usually conducted three times each semester. It is generally conducted during several days in order to call a broad range of people. 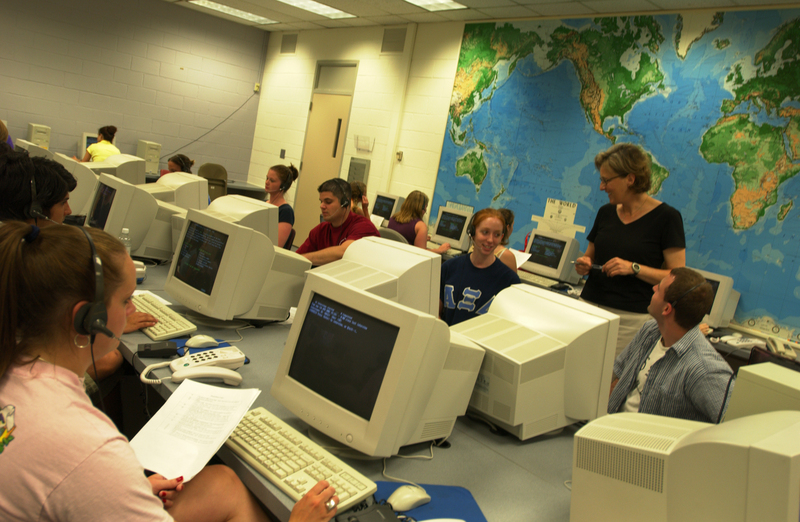 Students participate in the Elon Poll in 2002. The purpose of the poll is to measure issues, policies, and candidate status. According to the poll’s website, another goal is to measure “the why of citizens’ perspectives” and not just who they support. The independent survey is fully funded by Elon University and is a neutral, independent operation according to the Poll’s website. To see what North Carolinians thought about the 2010 midterm elections before they headed out to the polls, click here for the most recent Elon Poll results. Conducted using a stratified random sample of households derived from both wireless and landline telephone numbers. This entry was posted in Campus services. Bookmark the permalink.